Tendon imaging with Ultrasound Tissue Characterisation (UTC) is the most powerful tool in staging, monitoring and rehabilitating tendinopathies. Follow in the footsteps of the Olympic gold Dutch show jumping team, FC Barcelona and many top athletes worldwide and make use of the best in tendon control and management for your horse! The development of UTC Imaging has taken many years of painstaking work along with rigorous research protocols by professor Hans van Schie. 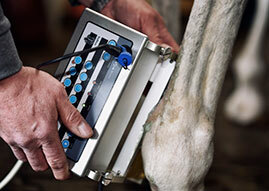 This has allowed UTC technology to evolve to its current position as the leading method of imaging tendon structures in Humans and Equines. Before UTC, it was impossible to evaluate tendons with a degree of sensitivity capable of detecting small changes in both cellular response and structural changes. 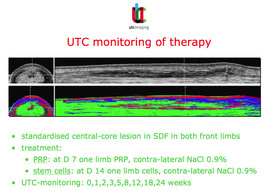 Paired with the Cook & Purdam model of tendon pathology, UTC imaging allows one to make decisions regarding tendon load and rehabilitation protocols at an accuracy level that is unattainable for others. This allows us to offer our clients with the most accurate and effective tendon management protocols currently available on the market. Ensuring tendons return to competition state is far more efficient when one is able to visualise the various tendon fibres. UTC technology can quantify the consistency and quality of the tendon fibrils and reflect these as a numerical value allowing discrimination to the level of 0.001%. This allows decisions pertaining to prognosis, treatment options and rehabilitation progress to be made without guesswork. In the experience of our veterinary director, Dr Henk Offereins DVM, one always wants to “play it safe” as nobody wants to take the risk of a breakdown. UTC technology eliminates this risk by allowing one accurately determine when a horse is ready for full work thus ensuring one is able to avoid unnecessarily long rehab periods. Furthermore, another exciting application of our UTC technology is in the prevention of soft tissue injuries. 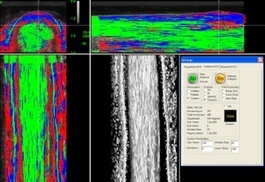 The UTC Scanner has proven its value in pre-purchase examinations where one can determine the quality of tendons and detect old or sub-clinical lesions. Moreover, UTC scanning at regular intervals throughout the competition season can detect if a tendon falls into a degenerative cycle and is at risk of injury. The prevention route is not a new one. There are several sports institutes and athletes such as F.C. Barcelona and the Dutch showjumping team who are currently using UTC technology on a monthly basis in order to monitor tendon health and adapt training levels and protocols if indicated.